Watching Durham Bulls Baseball: Breakout! Just about everyone on the Bulls team had a good day on Thursday up in Toledo. Maybe having Wednesday off made a difference. Losing string stopped at five. Brian Baker, after a shaky first inning, looked a lot like the guy we knew last year. The Bulls apparently decided to wait out Toledo’s pitching and drew a season high 11 walks. Add in 15 hits (3 doubles, 3 homers) and you have a terrific win. 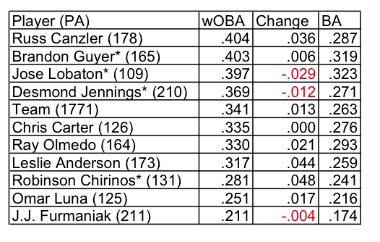 In the table below you will see that Russ Canzler has been really picking it up since the last time we looked a couple of weeks ago (May 11), and yesterday was no exception. He got on base six times (3 walks, 2 singles, and a double) and scored 3 runs. His wOBA has come up 36 points. Brandon Guyer also had a terrific day scoring 4 runs and also picking up 3 hits and 3 walks. Dan Johnson was in the lineup as the designated hitter and drew 2 walks, scoring one run. It will be interesting to see how long it takes him to get things going. The Rays have “claimed” Marlins pitcher Jay Buente off waivers and assigned him to Durham. Buente had to go onto the Rays 40-man so Rob Delaney was “designated for assignment”. This may take a day or so to sort itself out. For sure Buente will be pitching for the Bulls. The question will be in what role, starter or reliever? Help as a starter would be nice for the Bulls, but could be that the Rays are looking at him as a reliever. Some commentary here and here. Rob Delaney, who has been doing a decent job for the Bulls (14 appearances, ERA-2.57, FIP-2.58, WHIP-1.29) might end up with the Bulls, just not on the 40-man. If so, I’d guess someone will be heading back to Montgomery. My top candidate would be Jeremy Hall. Note that by making guesses like this I have yet again an opportunity to demonstrate to the world how little I understand the business of baseball. Lastly, for your amusement, note that Dirk Hayhurst appears to be going even a bit more nuts down in extended spring training. [DirkHayhurst] On the other hand, he is throwing. That's a good thing.